ADAMS, Mass. (Aug. 7, 2018) – On Sept 28-30, the Appalachian Trail Conservancy (ATC) and a partnership of conservation and youth-serving organizations will co-host the Massachusetts Youth (MY) Trail Summit, a hands-on opportunity for students, educators and service leaders to learn about public lands, outdoor recreation and the importance of effective conservation practices. The summit will take place at Bascom Lodge at Mount Greylock and will offer invaluable career skills for participants age 16 and older through a variety of stewardship activities and advocacy work. Participants will experience Trail maintenance, Leave No Trace principles and interpretive hikes while connecting with a new group of friends. 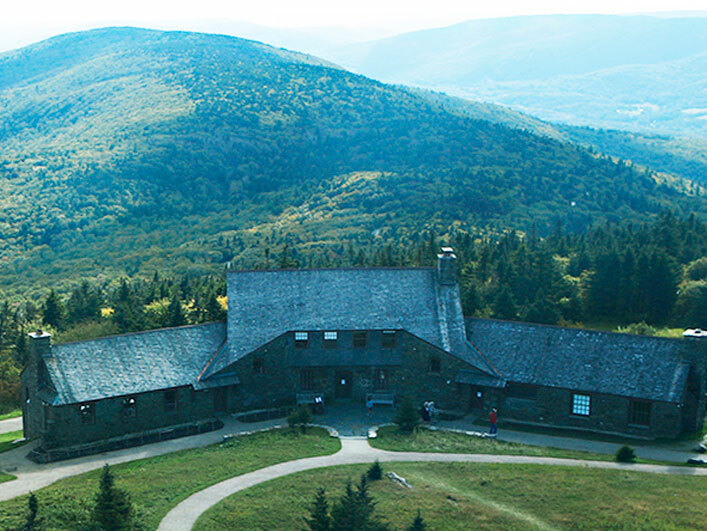 The MY Trail Summit will take place at Bascom Lodge located near the peak of Mount Greylock. Image courtesy of Bascom Lodge. Participants will also gain leadership and community organizing experience by providing ideas and recommendations on critical conservation issues. All program costs — including meals and lodging — will be provided and participants will receive ongoing support from local, state and national partners after the summit. A collaboration between the ATC, Appalachian Mountain Club Berkshire Chapter, Greenagers, ROOTS Teen Center, UNiTY, the National Park Service and other conservation groups, the MY Trail Summit will also offer hikes on the Appalachian Trail (A.T.) and networking opportunities with conservation leaders, giving regional youth a chance to expand their employment and stewardship possibilities. Participants will have an opportunity to explore Soulful Stewardship with Erica Wheeler and present their discussions and reflections to the public on Sunday, Sept. 30, before a presentation from author Cindy Ross. Youth ages 16 and older, leaders from youth-serving organizations, educators and staff from organizations and agencies tasked with protecting public lands are all encouraged to apply at tinyurl.com/MYTrailsSummit. The deadline for application is Aug. 30. Greenagers provides employment and volunteer opportunities for teens and young adults in the fields of conservation, sustainable farming, and environmental leadership. Through vocational-environmental programs and community engagement, Greenagers prepares youth for success in their education and work. The Mission of ROOTS: To be a place in Northern Berkshire County where youth ages 14-22 are heard, encouraged, and empowered. The Vision of ROOTS: Through our hearts, minds, hands, and voices, we strive to be healthy and impactful youth, ready for the challenges of today and dedicated to building a stronger tomorrow. UNiTY is the positive youth development entity of the Northern Berkshire Community Coalition. UNiTY seeks to bring together diverse groups of Northern Berkshire Youth in spaces and initiatives that allow them to express themselves while being empowered to make healthy decisions, be engaged in their communities, and become leaders in their lives. We believe these resources have intrinsic worth and also provide recreational opportunities, spiritual renewal, and ecological and economic health for the region. Because successful conservation depends on active engagement with the outdoors, we encourage people to experience, learn about, and appreciate the natural world. The National Park Service’s Rivers, Trails, and Conservation Assistance program supports community-led natural resource conservation and outdoor recreation projects across the nation. Our national network of conservation and recreation planning professional partners with community groups, nonprofits, tribes, and state and local governments to design trails and parks, conserve and improve access to rivers, protect special places, and create recreation opportunities. Erica is an award-winning singer/songwriter with songs that were rooted in a sense of place. She combines her background in natural and cultural history and her experience in the performing arts to offer inspiring and educational programs that deeply connect people and place. More at www.senseofplaceconsulting.com. Cindy has written about raising children alternatively, via outdoor adventures and travel, for a variety of publications. The author of six published books, she has lectured on the virtues of this educational approach and its effects on children's creative minds and their thirst for learning for twenty-five years.